Looted Antiquities at the Walters Art Museum? In anticipation of our event at the Walters Art Museum in Baltimore on Sat, Oct 29th at 2pm, we took a look at the museum’s wonderful collection of ancient art. It appears to have dozens of objects purchased from dealers with ties to the black market. 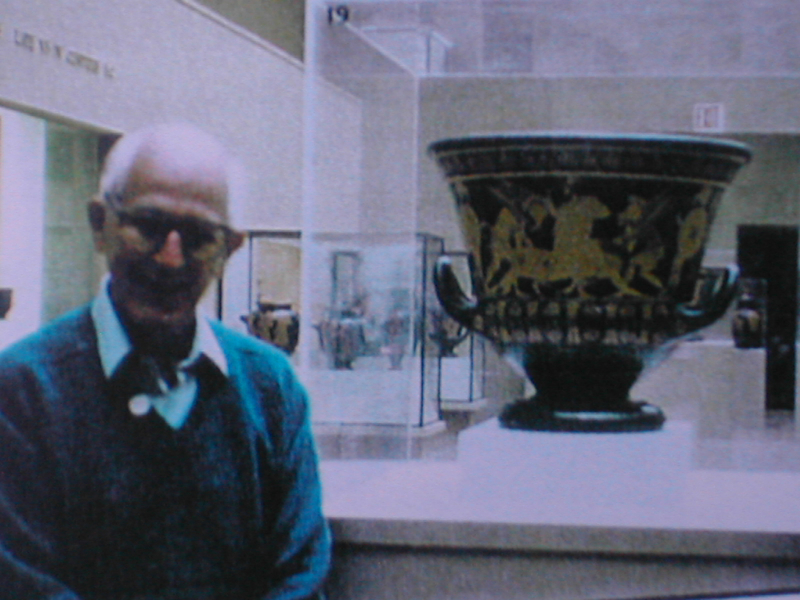 Robert Hecht poses in front of the famous looted Greek vase he sold the Met in 1972 for $1 million. Most prominent of those dealers is Robert Hecht, a 92 year-old Baltimore native and heir to the Hecht department store chain. 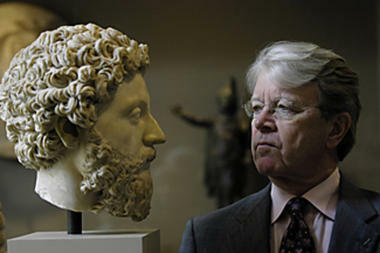 Hecht is currently on trial in Rome on charges of trafficking in looted antiquities over his nearly six decades as a prominent dealer based in Paris and New York. He has been well-known for trafficking in looted antiquities since 1972, when he sold the Metropolitan Museum of Art its famous Euphronios krater, which was returned to Italy. In his handwritten memoir, seized by Italian authorities in 2001, Hecht recounts a long career of buying looted objects from Italian middlemen and selling them to American museums. Among the more than a dozen pieces at the Walters purchased from Hecht is this griffin “protome,” which the Walters bought directly from the dealer in 1999. It is said to be Greek from 640 BC. In his memoir, Hecht describes buying griffin protomes from his “faithful purveyor” Giacomo Medici, the Italian dealer who has been convicted of being a key middleman in Italy’s illicit antiquities trade. It’s not clear if the Walters’ protome is among those Hecht mentioned. We asked Gary Vikan, museum director since 1994, about the protome and other Hecht objects in the collection. 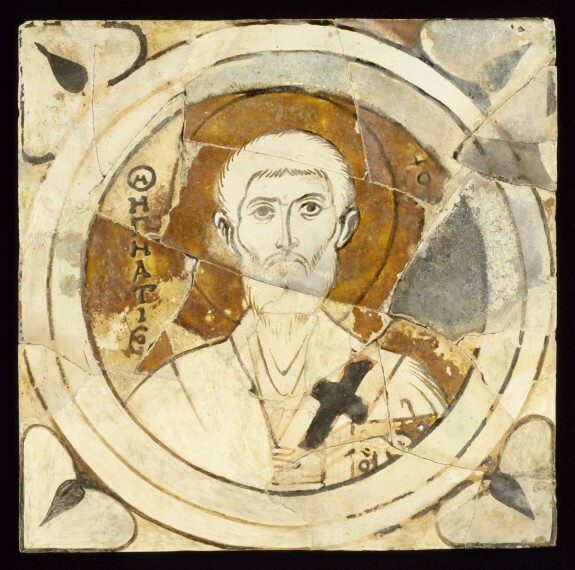 Hecht was also the source of several remarkable Byzantine floor tiles at the Walters, including this one depicting Ignatius the Bishop of Antioch, which was purchased from Hecht in 1950s. According to the Walters’ website, Hecht acquired them directly from a man in Turkey. Another man who regularly supplied the Walters was Nicolas Koutoulakis, a prominent dealer who owned the Paris gallery Segredakis. His named appears in the “org chart” of the illicit antiquities trade found by Italian police in the 1990s with a direct link to Hecht. Greek drinking cup purchased from Nicolas Koutoulakis. Many of the Hecht and Koutoulakis objects in question — though not the griffons — were purchased by the Walters before 1970, the date of the UNESCO accord on cultural patrimony which most museums and archaeologists today accept as bright ethical line. But if the Hecht and Koutoulakis objects were looted from Italy or Greece, as is reasonable to suspect, they could be considered stolen property under US law, and the Walters would not hold clear title to them. 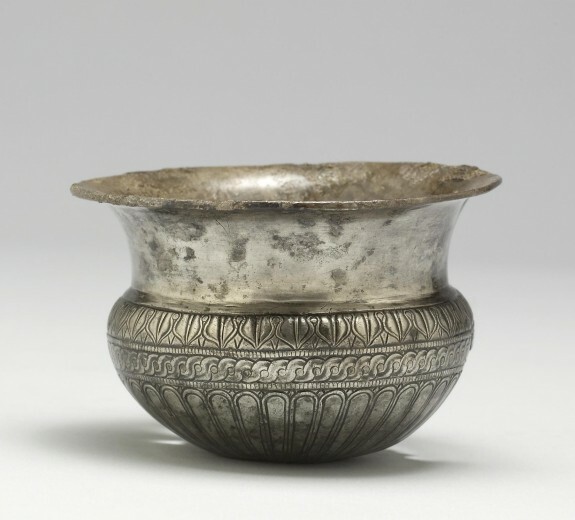 When we asked Vikan what he thought should be done with such objects, his answer was somewhat glib: “Put ’em out there!” We applaud the Waters for its transparency with provenance information — many museums do not post an object’s ownership history online. But in our view, putting suspect antiquities on display is not the same as a proactive investigation or notification of Italian or Greek authorities. There’s no easy answer for how to handle the thousands of suspect objects still in American museum collections today. But waiting for Italian authorities to knock on your door has not always worked out well for other museums. We look forward to exploring these issues with Gary and former Getty antiquities curator Arthur Houghton on Sat at 2pm.